My mum read my first blog post. “It’s great!” she said yesterday when I popped over for lunch. (She’s my biggest fan – that’s her job.) “You know, I really love that photo of the kids in the tunnel.” (She means the header above). “Yeah, me too,” I agreed, sensing the not-so-stealthy approach of a ‘but’. I countered with something about the artistic merit of the photo outweighing the possibility that people might think I’d have my kids walking barefoot through human waste. The conversation pretty much ended there. Not much else to say, really. The tunnel is actually our ‘secret place’ – a spot just near Mum and Dad’s house, where I grew up. 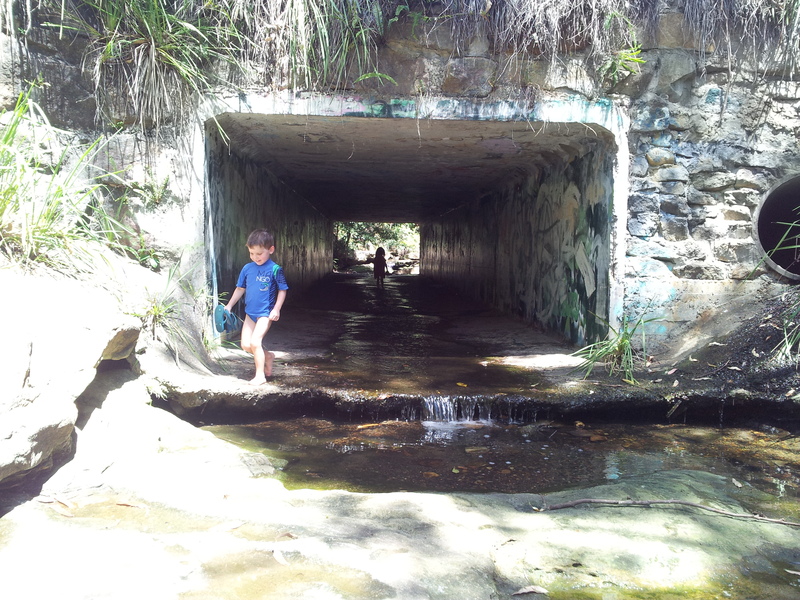 It’s the outer ‘burbs, and the stream is a freshwater creek, which passes through the tunnel as it goes under a road. If I may say so myself, this photo is very cool. I love the contrasting light and dark; the graffiti. I love my little silhouetted gangsters. Or demon hunters. Vampire slayers? Whatever they are, they are epic. I took it with my phone. It’s unedited. A total fluke. Here’s the tunnel from the outside – not quite as cool, hey? Right. Now that I’ve cleared up that I don’t encourage my kids to traipse through sewerage as part of their outdoor education (there you go, Mum), I’m going to move on to the main point of this post, which is how our real-life adventures with kids can create curiosity, and become the foundation for a love of books, if we choose the right books. It seems pretty obvious, and all adult readers know, that to derive enjoyment from reading, we need to choose reading material suited to our interests. We might have varied taste in books, or have a particular preference for one or two genres, but regardless, there are particular books that will take our fancy over others. Kids are the same. By the time they get to three, kids have developed an interest in particular things, based on their experiences. Of course, our interests as parents are a big influence on kids. What we have read to them, or shown them, and the places we have taken them, will be central to what they like, and what piques their interest. What we need to do then is build on that interest, and choose books that we know will engage them. Learning occurs when we are building and expanding on what is already known. Phoebe and Blake love our secret place. Every time we visit Nanny and Poppy, they want to visit the tunnel. They shout in there, revelling in the reverberating acoustics. They splash through the water barefoot, the green algal slime squishing between their toes. They reach for the cobwebs above, and float leaf boats down the canal. At the other end, they search for tadpoles in the cool, clear pool, and try to spot water dragons in the knee-high grass at the creek’s edge. When I brought home the picture book “The Tunnel” by Anthony Browne last week, P and B were immediately interested. Added to the obvious title and the intriguing cover image, the central characters are a brother and sister, just like them. 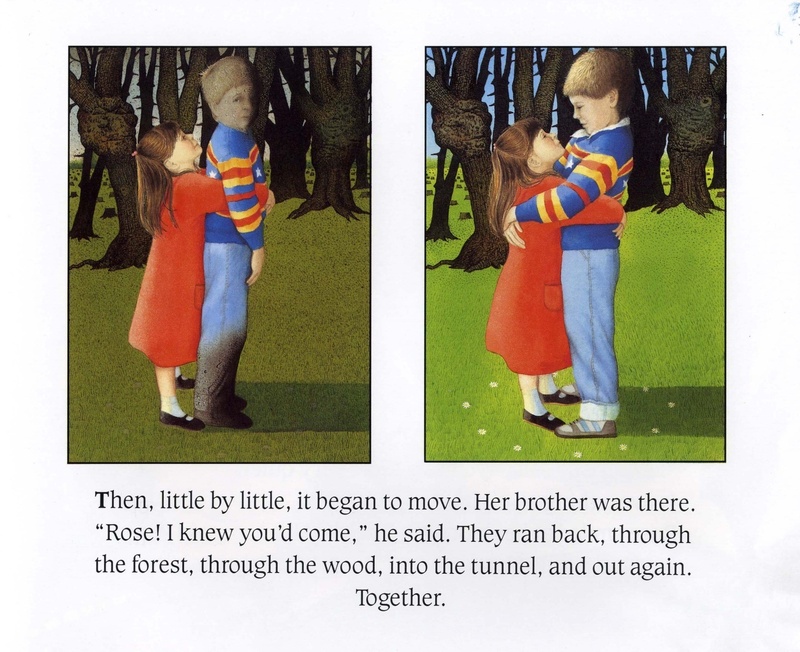 As in many of Browne’s picture books, the narrative explores a family relationship – in this case a distant relationship between a brother and his younger sister. They have separate interests. He likes sport. She likes reading. They just don’t get along. Mum sends them out one day together and tells them to work out how to get along. 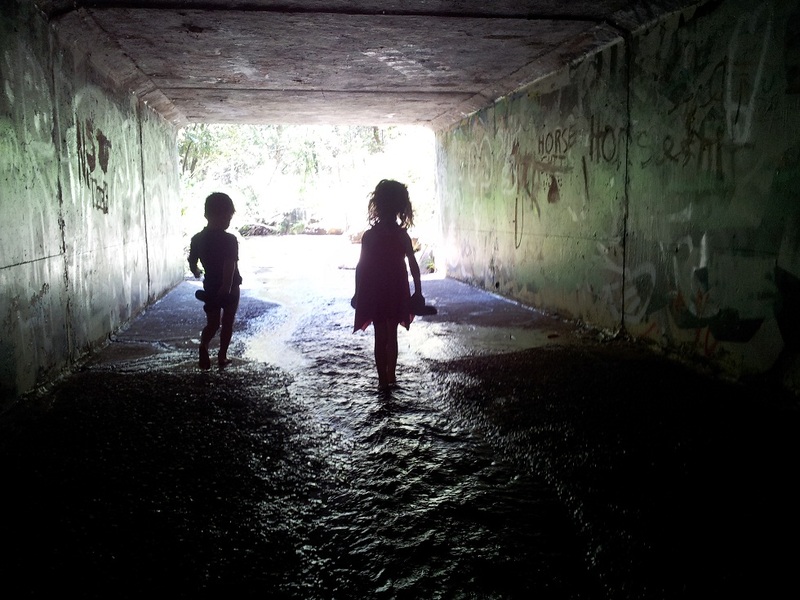 Upon discovering the tunnel, the boy heads immediately in, leaving his sister behind. After a long, worrying wait for him to return, with no sight or sound of him, the girl follows her brother into the tunnel and finds herself in a forest, which grows increasingly scary. She finds her brother in a field beyond the forest, turned to stone. It is her hug that returns him to life, and returns life to their relationship. 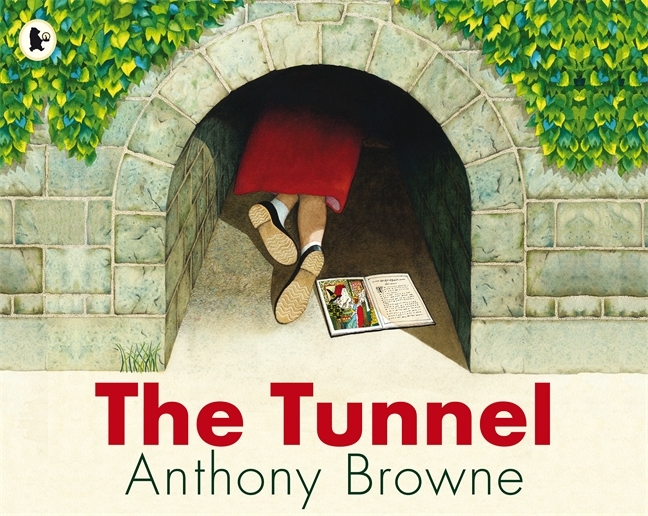 Browne’s message in “The Tunnel” is typically one of the importance of family connection and communication, and, as in many of his picture books, is told through the surreal and fantastical. His books don’t always make sense, but the message is always clear. I wasn’t sure about introducing the kids to “The Tunnel” yet, given the scary forest that comes alive, the mention of witches and goblins and giants, and the boy turned to stone, but their love of their own tunnel has them thoroughly wrapped in this book. At almost-four, they are starting to get the idea of fantasy and make-believe, and can distinguish the imaginary from the real. Not to mention the close bond of Rose and Jack at the end – we only discover their names once they connect with each other. There are so many levels on which to read this book. You can read it to your children from three to thirteen, and you will get just as much, if not more, from the reading than your children do. At three, it’s a journey through a tunnel and back. At thirteen, kids will understand the nuances of the relationship, and “read” the images. We use it as a visual text with our Year 7 and 8 students at school. Whether you have a tunnel (why not set out to find one?) or not, this picture book has a lot to offer – especially for siblings who may not have a lot in common. My key message here is do some research on the books you choose for your kids. Check out the library, Google, talk to other parents about their favourite books, and try to match the book to your kids. Even better, ‘live’ the books – follow the footsteps of the characters! If you can do that from a preschool age, you will have kids who engage with narrative, who appreciate language, who can relate to stories, and most of all who love books – skills that will last a lifetime, and make school a lot easier. ← Could your preschooler be a genius? And the illustrations were fantastic – the witches and bears carved into the trunks of the trees, not immediately obvious at first glance. Ah, the joys (and horrors!) of the imagination! Thanks Katie, I just can’t get enough of Anthony Browne, and neither can my kids! You’re right, the pictures work on so many levels. The weird and the wonderful certainly capture the imagination! Love the image of the tunnel, we are book mad at our house and the TV rarely goes on at night time we sit and read our own books next to each other. I love to hear what excites my daughter when she is reading a novel. Thanks for the good read look forward to more. Thank you and thanks for the follow! I love finding new books to share, and sharing the joy of reading. Love hearing others are the same!